Living near the coast, long life and few offsprings make these dolphins especially vulnerable to human activities. For this reason, in 2014, ACOREMA launched the Campaign The Bufeos and You, Much in Common. The aim is to contribute to the long process to establish an affective and conscious link for a better coexistence between the local population, together with the high number of national visitors, and the groups of resident dolphins of the Pisco province. Posters, leaflets, booklets, large prints, 3 video spots and children educational sheets were produced to inform and raise awareness to a wide public. The information covers the characteristics, values, needs, problems and how to help the resident bufeos, but overall highlights some features that humans and bufeos have in common. The materials were distributed in spaces used by many people, such as markets, restaurants, fish landing sites, stores, tour agencies, and dependences of governmental offices and both local and regional governments. It were delivered to the media making possible their dissemination through their daily shows. The resident dolphin groups of Pisco are getting new and valuable friends that seek to know them and care. For example, in 2014, the María Montessori School (San Andrés), the School 22489 Paracas (Paracas) and the Fermín Tangüis School (Pisco) were able to insert the Campaign The Bufeos and You, Much in Common in the school curriculum. 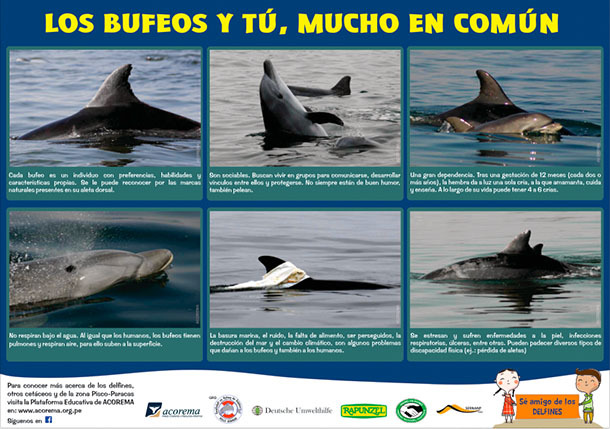 In fact, three females of The Paracas Bay Dolphins get their names thanks to the students from those schools. From now on, ACOREMA will continue studying these dolphins using the assigned names. To learn the names of the principals, teachers and assistants that make this possible and the activities they developed with their students make click here. The Campaign has the auspice of SERNANP /Environment Ministry. Support is provided by GRD, Deutsche Umwelthilfe y Rapunzel/Naturkost/Hand in Hand. Participants include the Paracas National Reserve and the System of Islands, Islets and Guano Points National reserve (both reserves ran by SERNANP), the María Montessori School (San Andrés), the School 22489 Paracas (Paracas) and the Fermín Tangüis School (Pisco), among local actors. The schools count, you count! Click to watch the spot 1: The Resident Bufeos of the Pisco Province, Peru. Chapter 1. Click to watch the spot 2: The Resident Bufeos of the Pisco Province, Peru. Chapter 2. Click to watch the spot 3: The Resident Bufeos of the Pisco Province, Peru. Chapter 3.